Connect allows you to send push notifications to both Android and iOS users. You can see which providers are set up on Connect's Providers page, by clicking Settings icon ( ), then click Settings > Providers. A 'Message Body' is required to send out a standard push notification. You must also select at least one of the two providers (iOS or Android). When sending a basic push notification, Android requires a Title field. All other options, for both iOS and Android are considered optional. 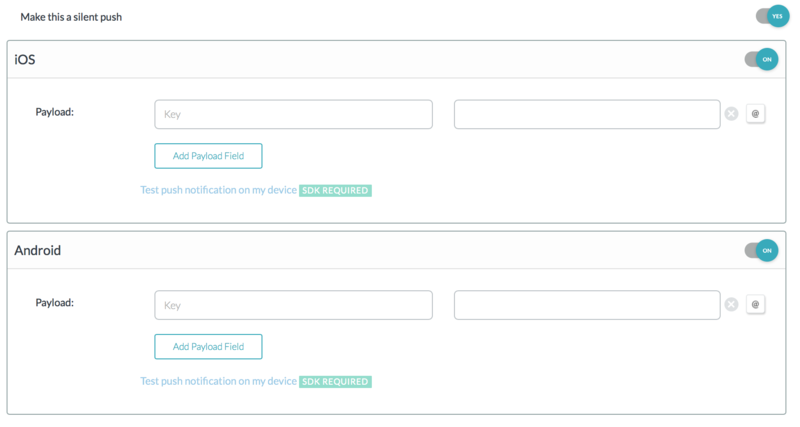 Any fields that have the label "SDK REQUIRED" require the use of our iOS and Android SDKs. Our iOS push notifications support the entire APNS dictionary. We automatically handle the "content-available" field. Deeplinking is a feature of our iOS SDK. If you have not already, be sure to include our extra code in your AppDelegate.m file. In order to deeplink to a specific page, fill in the deeplink field with the corresponding url. Deeplinking is a feature of our Android SDK. If you have not already, be sure to setup your intent-filters within your application. 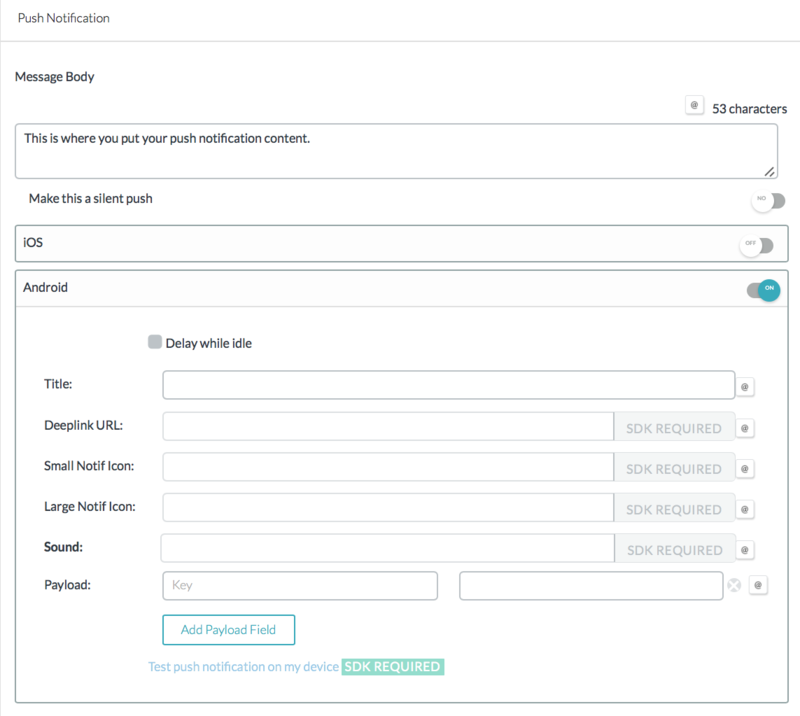 In order to deeplink to a specific page, fill in the field with the corresponding url contained in your intent-filter. Delay while idle allows you to hold off on sending a push notification until the user's device is no longer idle. For this field, we accept a collapse key. 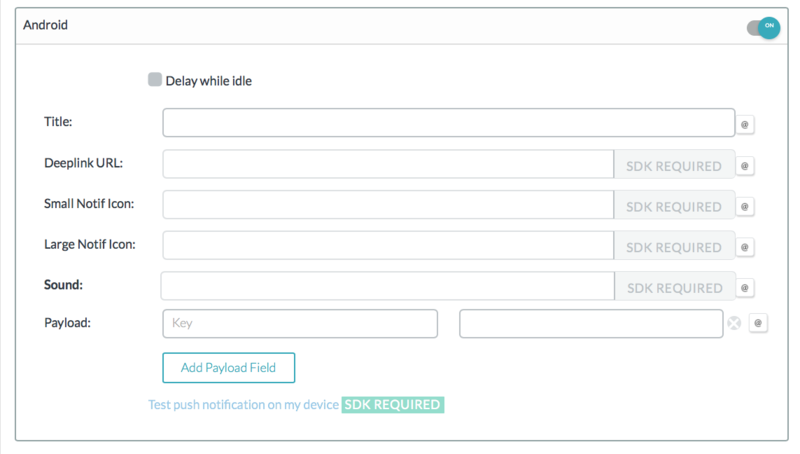 The silent push setting enables you to send over payload parameters without displaying a notification to the user. 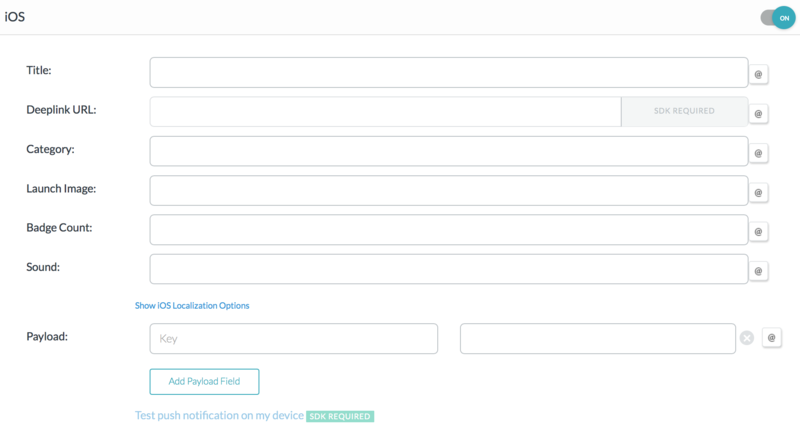 This is often used to trigger custom logic within your app or if you wish to handle the push notification differently. 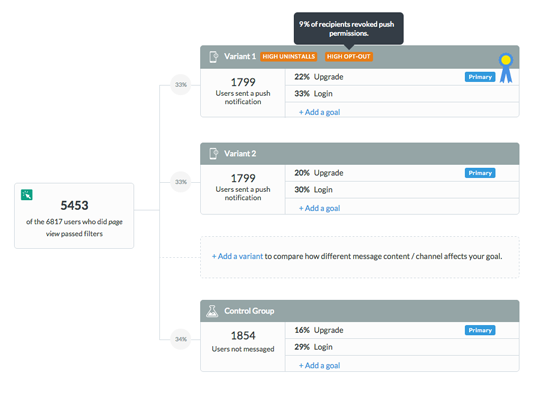 This feature allows you to determine if your campaign variants are causing users to uninstall your the application. This is an important parameter to consider when deciding which variant is 'winning'. While a variant may give the highest conversion to your primary goals, it may also contain the highest opt-out/uninstall rate.